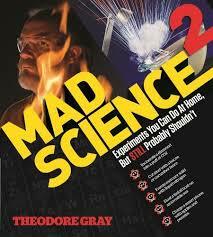 Mad Science 2 follows in the footsteps of Theodore Gray’s 2009 book Theo Gray’s Mad Science Experiments You Can Do At Home, But Probably Shouldn’t. In Mad Science 2 Gray bravely dips his finger into molten lead to demonstrate what’s known in science as the Leidenfrost effect. In a particularly messy experiment he crushes a tomato demonstrating the extreme power of neodymium-iron-boron magnets. And, in a wonderful instance of science meets art, he creates lovely, albeit ephemeral, trinkets out of solid mercury, thus demonstrating how the state of matter depends very much on the temperature at which it exists. Science, does any layman really understand it? It is one of those topics that you either get or you don’t, yet it is one of those things that happens around us every day and we never question it. As a homeschooling mum it is one of those topics I sure dread. Yep when they are little it sure is easy, grab a magnet or two or do some cooking, but as the high school years creep upon us we scratch our heads and wonder where all these bigs words came from. Never fear, Theodore Gray is here! Mad Science 2 explains it all and even throws in a little history. Did you know that the first Light-Emitting Diods went on sale in 1962 and that in July 2007 Scott Showalter climbed into a manure pit on his Virginia farm to clear a blocked pipe, dying moments later? Mad Science 2 is interesting, well thought out and visually pleasing. It has a good balance of reading to picture, with the large photographs giving you the visual that helps your mind fill the spots where the written has you scratching your head. As a homeschooler of a teenage son this book has been a hit. There is the practical knowledge, the impractical knowledge, the practical fire and the impractical fire. Throw in the danger factor of the chapter in which the author endangers his hand, some chemical power and a little bit of making stuff and you are sure to have a best seller. Well done Theodore Gray, you have managed to take the topic of science and put a little spark in the interest column.